Indonesian imports growth is expected to ease through this year compared to last year as lagged impact of Rupiah depreciation will start to take effect, in addition to lower oil price, according to the latest research report from DBS Economics. Worsening trade balance is the biggest risk; despite declining oil price, the trade deficit will still likely widen to USD4.6 billion in Q4 2018 from USD2.6 billion in Q3 2018. Imports have eased significantly in December 2018 to 1.2 percent y/y from 11.8 percent y/y in November last year, but not enough to compensate the contraction of exports, recording -1 percent y/y in Q4 2018 from 9.5 percent y/y in the first three quarters. 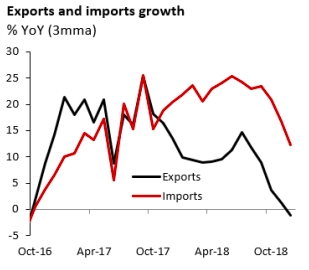 Yet, the risk of exports slowdown might remain on the horizon despite the more competitive Rupiah as China and overall global trade demand fall. In fact, exports to China has already contracted significantly starting in November 2018, averaging -0.1 percent y/y from 33.5 percent y/y between Jan-Sep. Even though terms of trade have improved with lower oil price, trade deficit might stay wide as the difference between imports and exports volume growth becomes wider. There are no short-term solutions to close this imports-exports gap. Industrialization plan to develop export-oriented industries would be beneficial in the medium run, the report added.